Ards will be relegated from the Irish Premiership if Warrenpoint win on Saturday after this scoreless draw with Ballinamallard at Clandeboye Park. The basement side are seven points behind Warrenpoint, who play Dungannon Swifts, with just three games left. Ards squandered chances early in the game with William Faulkner's shot cleared off the line before Andy Mitchell hit the side-netting. 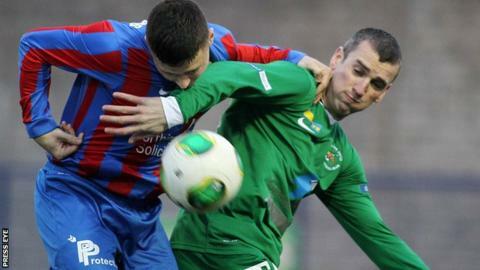 Mallards defender Mark Stafford headed over late in the game. It was a match Ards had to win but they were frustrated by poor finishing and resolute defending from the County Fermanagh visitors. Fergal Murphy made a string of fine saves with Craig McMillan seeing his shot saved by the Mallards keeper in the second half. The visitors also created openings, including Cathal Beacom heading wide from a Jason McCartney corner. Ballinamallard are now four points clear of the relegation/promotion play-off spot.